Party Equipment Rental is easy nowadays. You can get whatever you need just a couple clicks away. From Chinaware to themed bounce houses. Today, we will take a look at the best bounce houses for rental. If you go online, you can find several websites to get your favorite bounce house. It is as easy as inputting your zip code and answering a few questions about the bounce house you would like, for how many people, the age of guests and the date and time you will enjoy the party. In this entry, we will talk about bounce houses rental Miami compared to some of the best in California! 1. Nicky Party Rentals is a licensed, insured, full-service company for party rentals, whether is backyard birthday party, a celebration at the park, a school festival or a corporate event, they can assist you. 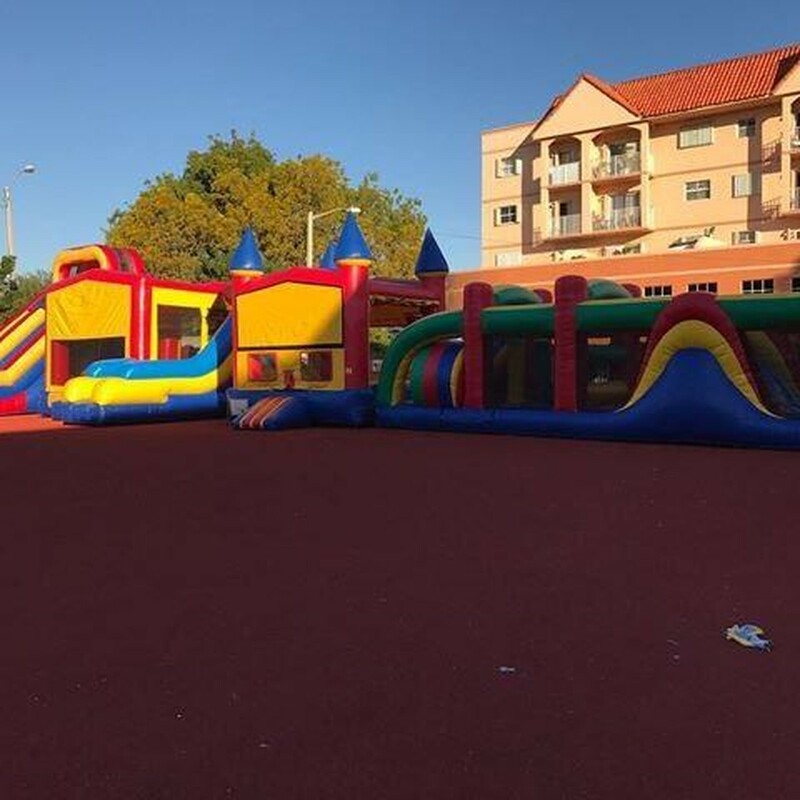 Bounce house rental Miami offers a variety of party supplies; tables, chairs, concessions, canopies, PA systems including house bouncers. Nicky has the Bounce House you need! Online, you can find a catalog with different themed bouncers and sizes. Some of the themes they offer are the classic bouncer, the castle bouncer, the crayon bouncer, the birthday bouncer, etc. You can check that according to customer's review, the reservation process is easy and the prices vary depending on the size, however, the price is reasonable, also, at Nicky Party Rentals bouncers are setup for the price included. 2. San Diego Jumpmasters. Rather than a party supply company, this company rents several products including jumpers, bouncers, ropes, duck tanks and other items for kid's birthday parties. This family business priority is to keep kids and parents satisfied by offering excellent customer service and also a great variety of products, however, they specialize in building and renting jumpers. This company is also, certified to deliver to houses and all parks in San Diego. Prices depend on size and style, but they range from $99 to $125 a day. The great thing about San Diego Jumpmasters is that if they don't have it, they can refer you to another company that does! Customers seem happy with the services, notably with the creative designs they offer. 3. BB'S ECO JUMPS OF SAN DIEGO is an Eco-friendly inflatable party rental business. This company just like the rest, rents jumpers for every occasion, from a child's birthday to a community gathering. BB'S ECO JUMPS OF SAN DIEGO serves the entire San Diego region. The jumpers they provide goes from very a basic design to water slide jumpers. This company has something special, they have a go green philosophy. The company inflates bouncers using generators that work with two types of substances, one that runs on gas propane, and the other one that's powered by heating corn oil. 4. So Cal Bounce is also from San Diego California, this party rental company is a family business that has a primary mission, which provides safe and clean equipment for every type of event. The bouncers that this company offers are manufactured in the U.S. and its quality is undeniable. So Cal Bounce offers many different types of bouncers. It is likely to say that this is the company that has the most variety of jumpers, from traditional bouncers, Bouncer slides, water slides and obstacle courses. So Cal Bounce as is a family business that cares for customer's security, therefore, they will provide you with the necessary security measures and rules to properly use a bouncer. So Cal Bounce offers different package deals that start from $195 and includes a castle bouncer, a cotton candy machine, and a spin art machine. 5. Air bounce San Diego takes all the customer's review. They have an amazing post about their services and prices. Whether you call them Bouncers, Bouncy, Bounce House, Jumper, Jumpies, combos, or slides, here you’re sure to find what you are looking for! This company does not only provide bouncers and party rental equipment but also can cater food for parties and even for corporate events. Bouncers and slides have beautiful and classic themes from Disney princesses and characters to Marvel or DC comic heroes like Spiderman or Batman. Air bounce San Diego offers amazing party package deals for every type of customer. You can find all the information you need on their colorful website. Prices go from basic jumpers $94 to combo module jumpers $204 a day. Now you know, if you are seeking to plan your kid birthday party, you have many options to choose from, just make sure you have an idea of the type of bouncer you are looking for!